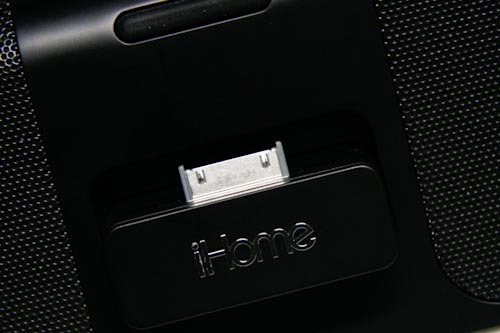 The iHome iP46 is a versatile, portable, and battery-powered set of good quality speakers for your iPod or iPhone. Long battery life and good quality sound make these speakers perfect for taking your tunes on the road. The line-in port on the back and size adds to the design making this a great addition to the road-warrior audiophile’s collection. 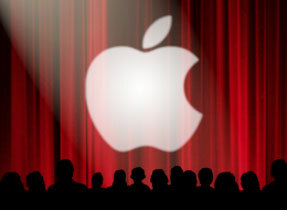 I’ve been fortunate enough to test the brand new iP46 from iHome Audio. 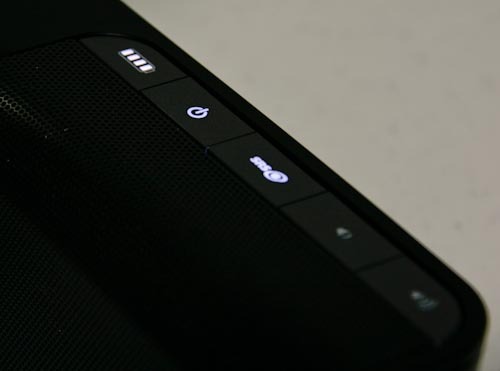 The speakers are designed to go on the road with you providing untethered sound for you and your fellow listeners. The internal rechargeable Lithium ion battery lasts about eight hours, meaning you can get plenty of sound without having to plug in. 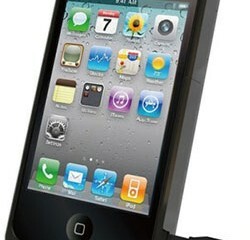 The iHome iP46 portable Audio for iPod and iPhone is available for $90 from Amazon.com. In my tests the iP46 also functioned very nicely as a night stand charging and music playing solution. The speakers come with an AC charging adapter with foldable prongs which doesn’t take too long to charge from a fully dead state. Most of the time I use it during the day and then charge it over night. With the free iHome+Sleep app installed on your iPhone or iPod Touch, you can use the speakers and your iOS device as a sleep-timer device to go to bed to music with an alarm to wake you in the morning. I set it up to play some music and it went off at the designated time. Then it came on and woke me up in the morning just fine. In my experience the iP46 worked flawlessly with my sons’ iPod Touches. 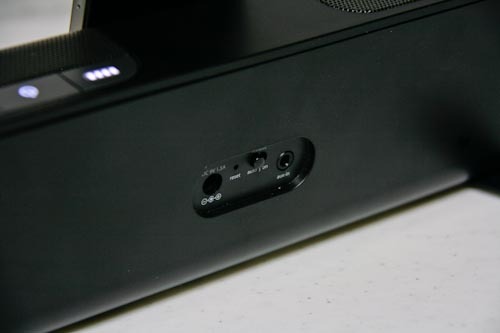 There is a retractable dock connector on the front of the speakers. Press and the dock comes out of the front and you can slide the iPod down carefully. It begins charging if the iP46 is plugged in via the AC adapter. When the iP46 is running on batteries it will not drain the battery to charge your iPod. This way the speaker battery lasts longer. I do wish it had the option to turn on charging even when not plugged in so that you could charge your iOS device in a pinch. There was occasionally an issue when using the iP46 and an iPhone. My wife’s 3GS and my son’s 3G seemed to work fine, but on occasion I had a little trouble with my iPhone. Intermittently the warning that says this device was not intended for this iPhone would appear on the screen after plugging in my iPhone 4. Usually, if I would restart my iPhone by pressing and holding the top power button, this solved the problem. 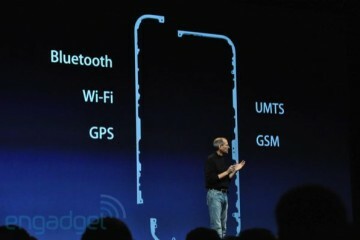 Also, with my white Belkin Reveal case on the iPhone it would not get a good connection. So you will want to remove your case if this happens to you. 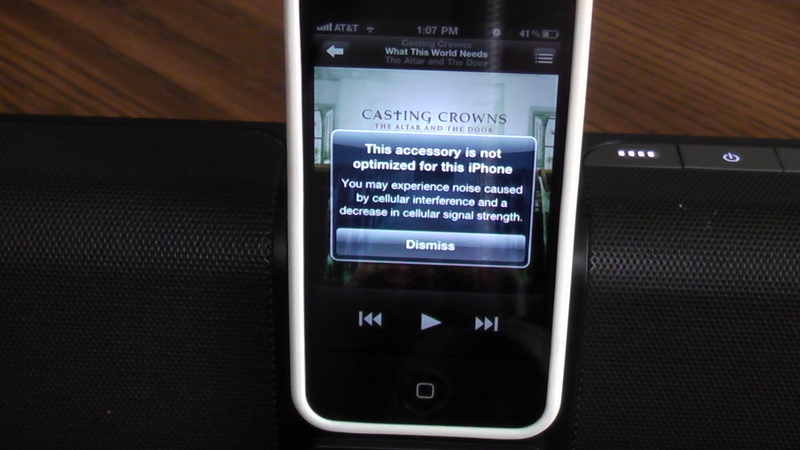 These flaws are minor and do not negate the usefulness and good sound quality of the speakers. 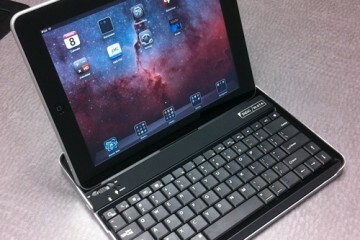 The iP46 was not designed to work with the iPad and in my test, it didn’t charge the iPad or drive sound. 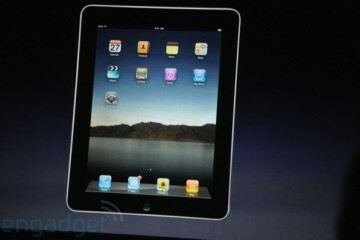 The iPad is also too heavy for the retractable dock connector; it felt like it would fall off. When it comes to speakers, the single most important thing is the sound. I am not an audiophile, but I think they speakers sound great. 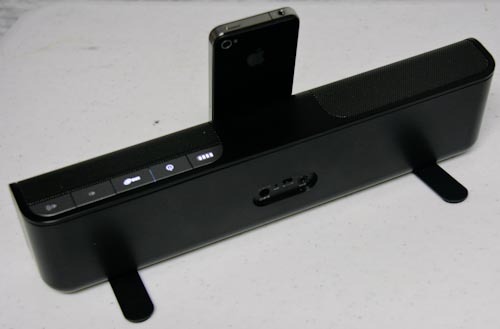 The iHome iP46 has four speakers, two active and two passive speakers. There is an SRS button that boosts the bass of your music. For some music this made the sound even better. But for other songs it gave them a muddy sound, that was quickly fixed by disengaging the SRS functionality. Just test it with the album you are playing. Most of the time, the SRS was a real boost in sound quality. However, spoken word and some music was better with it off. Besides plugging in an iOS device, you can use the iP46 with any device that can be plugged into a 3.5mm stereo jack thanks to the Line In port on the back. In my test the sound was just as good with an iPod as it was with the Line In port. There is an optional remote, which I did not test. On the back of the iP46 there is a sliding switch that sets the device to either Auto or On. Auto will disable the remote when it is working with the battery and the On position sets it to work with the remote all the time. The reason you might do this is to save battery life while not plugged in. When I first set up the iHome iP46 I had a problem. The speakers are a little heavy and it would not stand up on its own. But then I read the manual and realized that there were two feet on the bottom that spin out to support the weight of the speakers. Turn them in when you are packing the device. For mobility, the iP46 was easy to throw in my notebook computer bag. 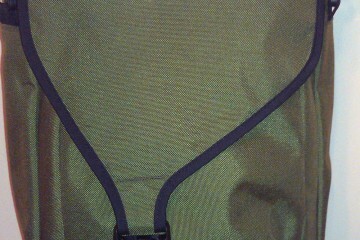 I do wish the AC adapter had some velcro to keep the wire from getting tangled in a bag. And the iP46 is a little heavy, so I wouldn’t want to carry it around in my computer back all the time. 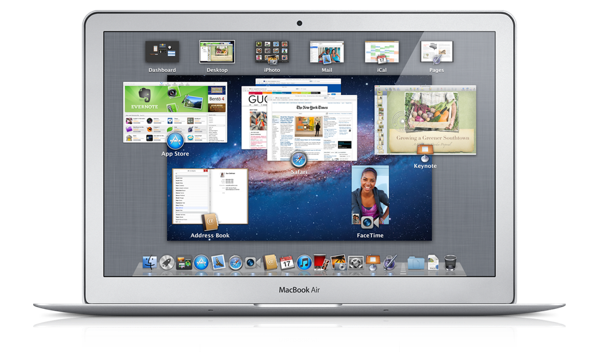 But for occasional use it fit well since it is only 13-inches wide, 3.6-inches high and 1.9-inches deep. The only significant problems I had, besides the intermittent incompatibility with my iPhone 4, was that after sitting in my computer bag for a full day, it just wouldn’t turn on. At first I thought it was just dead, so I plugged in the AC adapter. Nothing. Maybe it needed to charge for a while. So I let it charge for a couple of hours, normally plenty of time to fully charge. Still nothing. 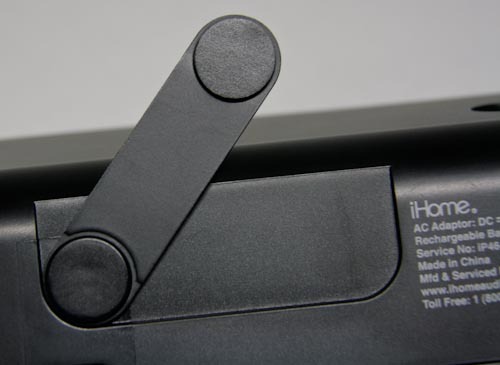 So I read the manual and it says that sometimes you have to reset the device by sticking a sharp object like a paper clip into the small reset hole on the back. I did this and it worked just fine. Secondly, you have to be careful about putting the iP46 in a bag. It might accidentally turn on in your bag draining your battery. These are minor flaws and didn’t detract form the fact that, overall, I loved the iHome iP46 speakers. The iP46 is $99.99 direct from iHomeaudio.com. While that seemed a little steep before I used it, I would easily pay that now that I have tested it. Also, I found it listed at Amazon for $90 or less if you want to take a chance on one of the lesser-known Amazon resellers. If you want to check out the manual for more information, you can download it from the iHome Audio site in PDF. Best wishes to you and want the most ideal for the year 2010. Great way to explain. I can not say much more to value than what is written. can prove the best way to add your RSS feed? I could not find a way.